By Chris Williams: Trainer Floyd Mayweather Sr. is extremely disappointed with the lack of progress that former IBF/WBA light welterweight champion Amir Khan has made while under the guidance of trainer Freddie Roach in Los Angeles, California. Mayweather Sr. doesn’t see any improvement in Khan’s game whatsoever since Roach started training him and says that he’s seen women that fight better than Khan fights now. Mayweather Sr. saw Khan’s recent fight against Lamont Peterson and didn’t understand why Khan chose to run around the ring all night looking sloppy and needlessly wasting energy. Mayweather Sr. says he would have never let Khan fight like that if he were his trainer. Mayweather Sr. went on to make light of the awards that Roach has won and says that Roach has only taught his top fighter Manny Pacquiao how to throw a straight left hand and a double hook. Other than that, Mayweather Sr. doesn’t see Pacquiao as having developed much under Roach. 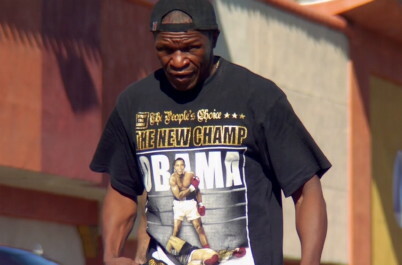 I think Mayweather Sr. would be a big improvement for Khan over Roach. I would dump Roach so fast his head would be spinning around his neck. He’s not helping Khan because you can see all the bad habits that Khan has. He’s running around the ring like a frightened chicken and holding and pushing every chance he can get. As far as I can tell, Khan hasn’t learned a thing on defense and his defense is his feet and his offense. He’s still just as wild as he was before Roach started training him. Mayweather Sr. would teach Khan to minimize all the wasted motion and get him to stand still, use his guard to pick off punches and to fire back with short hooks and right hands. He would teach Khan how to defend himself properly instead of having him run all night long. The way Khan is fighting, he won’t be able to keep that kind of high energy style as he ages. He’ll run out of gas every time and he won’t have the foundation in place for him to stop and defend without constant movement. Khan needs to dump Roach like a bad habit and sign on with Mayweather Sr. before it’s too late.